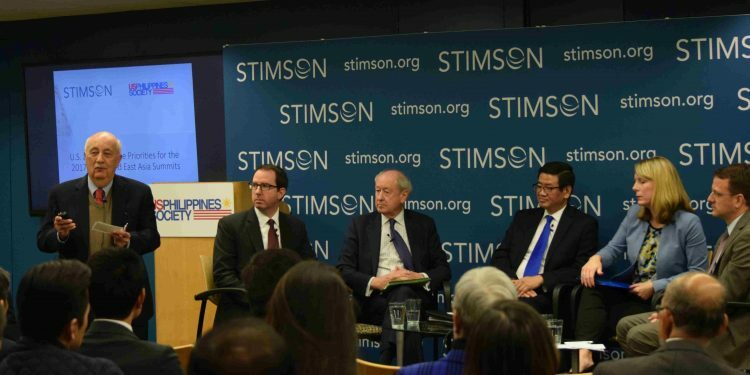 US-Philippines Society President Ambassador John F. Maisto(left) with panelists (l-r) State Department Desk Officer Richard Blackwood, SAIS Professor William Wise, CDA Patrick Chuasoto, ASG Vice-President Meredith Miller, and Stimson Center Director for Southeast Asia Program Brian Eyler. WASHINGTON, D.C.- At a October 31 forum, “A Preview of U.S. and Philippine Priorities for the 2017 ASEAN and East Asia Summits,” Deputy Assistant Secretary of State for Southeast Asia Patrick Murphy offered insights into the administration’s goals for the upcoming Asean and East Asia Summits as President Trump embarks on the longest presidential trip to Asia in more than a quarter century. Philippine Embassy Charge d’affaires Patrick Chuasoto detailed the Philippines’ role as host for the 2017 Summit Meetings. Both speakers addressed the multilateral and bilateral U.S.-Philippines agenda, and reaffirmed a commitment to the longstanding, cooperative and historically rooted relationship. A distinguished panel, including Johns Hopkins SAIS Professor William Wise and Ms. Meredith Miller, Vice President at the Albright Stonebridge Group and formerly a State Department Asian affairs specialist, provided a strategic perspective and discussed what’s at stake during high-level economic, trade and investment talks. 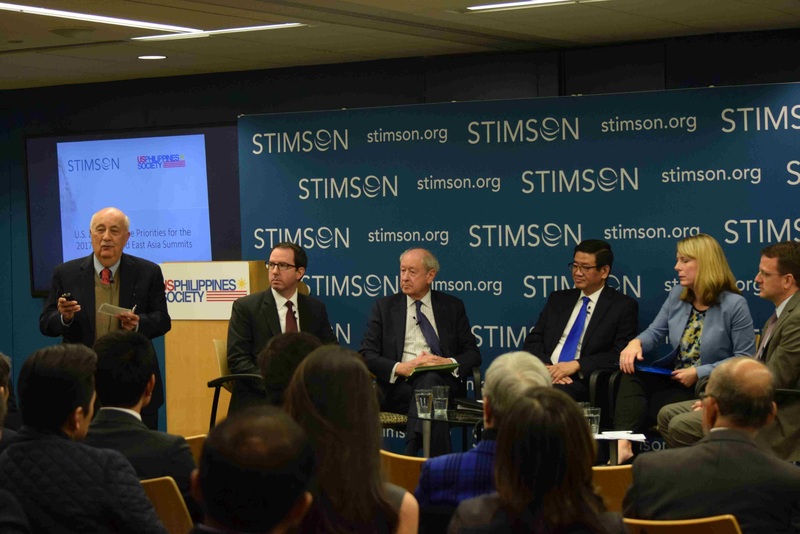 Speakers and panelists fielded questions from the 100-plus people who attended this “Summit Preview” event, co-sponsored by the US-Philippines Society and the Stimson Center. 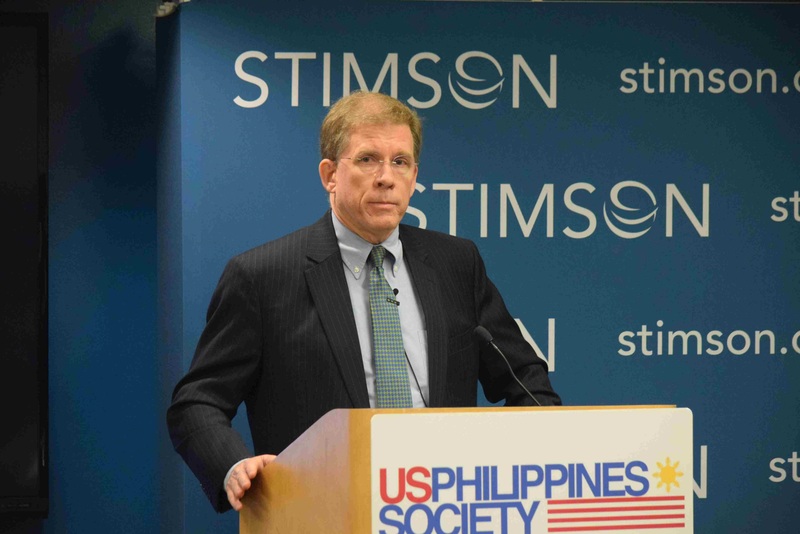 US-Philippines Society Executive Director Hank Hendrickson introduces featured speakers, DAS Murphy and CDA Chuasoto at the Stimson Center. Three Major Issues for the U.S. In his preview presentation, DAS Patrick Murphy highlighted three major issues: the North Korean nuclear threat, South China Sea tensions, and terrorism. He stated that a fundamental objective of President Trump’s participation in the summits is to signal continued U.S. support for peace and prosperity throughout Southeast Asia and the entire Indo-Pacific region. Murphy said the U.S. side will ask Southeast Asian leaders to consider whether North Korean actions are compatible with ASEAN’s principles underlying a commitment to regional peace, stability, security and prosperity. He specifically commended ASEAN statements registering concern over Pyongyang’s recent provocations. On the South China Sea, Murphy expressed hope for meaningful Code of Conduct negotiations with results that are legally binding, effective and consistent with international law. He noted that prospects for success in those negotiations depend on the willingness of regional leaders to speak out publicly and privately against further militarization and reclamation activities in the South China Sea. On countering the threat of terrorism, Murphy said the U.S. will convey a strong message to ASEAN pledging continued assistance in combatting ISIS expansion in Southeast Asia, adding that Washington will be a reliable partner in strengthening multilateral mechanisms to enhance aviation and border security, sharing information, and countering terrorist financial networks. Murphy cited the backdrop of the recent liberation of Marawi City from ISIS-inspired militants as regional leaders prepare to gather in the Philippines, and he cited the role of U.S. assistance to AFP operations during the Marawi crisis. DAS Murphy described Philippine-American ties as deep and enduring, reflecting shared experiences, aspirations and sacrifices. He said military to military relations are robust, and he noted the importance of strong people to people ties in underpinning bilateral relations. Murphy credited Ambassador Sung Y. Kim as playing an especially effective role. He recognized that both countries face serious drug problems and noted areas of cooperation in combatting the drug epidemic. The U.S. has expressed support for the “rule of law” in confronting the drug epidemic. Murphy concluded by noting that President Trump’s travel to Asia is eagerly anticipated across the five countries he will visit: Japan, South Korea, China, Vietnam and the Philippines. This will be the longest presidential trip to Asia in over 25 years and underscores Washington’s commitment to remain actively engaged at all levels as an Asia-Pacific power. Philippine embassy Charge d’affaires Patrick Chuasoto pointed out that the Philippines assumed the ASEAN Chair on the organization’s 50th anniversary and the 40th anniversary of the establishment of U.S.-ASEAN ties. CDA Chuasoto described Manila’s role in establishing 2017 ASEAN “thematic priorities” to promote inclusive growth, peace and security – all aimed at projecting the “ASEAN Way” as a model for effective regional cooperation. Chuasoto described a year of hard diplomatic work that has included organizing a series of more than 100 meetings leading up to the November summits. Progress has been forged to gain consensus on initiatives to promote the peaceful settlement of disputes, inclusive economic growth through entrepreneurship, resilience to natural disasters, and commitment to the principle of non-interference. The Duterte Administration has tabled a list of issue-areas for discussion and agreement, including protection of the environment, combatting terrorism, and other transnational and social threats. Chuasoto cited the Philippines’ interest in protecting the rights of migrant workers and securing agreement with China on protection of the South China Sea maritime environment. CDA Chuasoto noted the vibrancy of the US-ASEAN strategic partnership and emphasized the strength of trade and investment ties between the U.S. and ASEAN, which ranks as America’s fourth largest export market. On new people to people linkages, he cited the important role of the Young Southeast Asian Leaders Initiative (YSEALI) in building bridges between future leadership generations of Asians and Americans. Chuasoto welcomed President Trump’s visit to Manila on the 40th anniversary of the US-ASEAN partnership. He said bilateral ties are cooperative across the board and that the Philippines will welcome discussion on all issues, including the campaign to counter illegal narcotics. 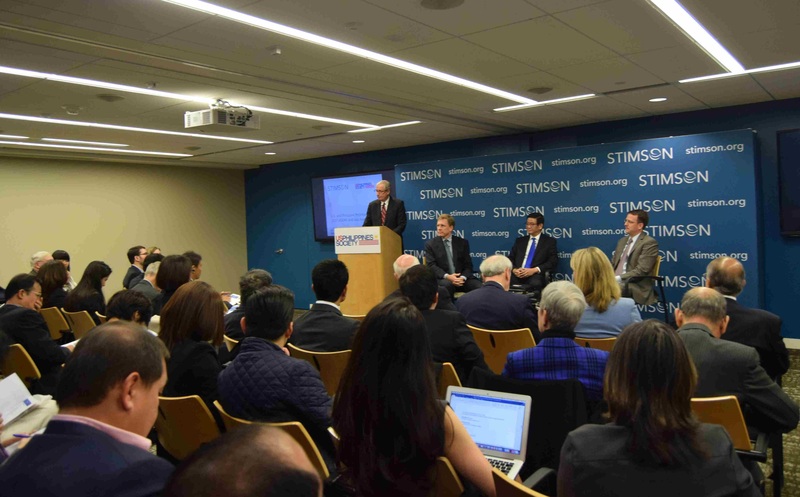 Panel discussions featured JHU SAIS Professor William Wise, who reviewed the strategic landscape, and Ms. Meredith Miller, VP of the Albright Stonebridge Group, who offered a perspective on the economic, trade and investment stakes. Prof Wise reminded the audience that foreign policy cannot be divorced from domestic political realities and cited the potential of the ongoing Mueller investigation in Washington to impact President Trump’s standing in international affairs. In looking ahead to the bilateral meeting between the U.S. and Philippine presidents, Prof Wise wondered about the “chemistry” of two strong personalities and prospects for establishing a personal bond that can be useful in promoting cooperative official ties. He described the scope of USG assistance provided during the Marawi Crisis and wondered whether President Trump will offer more initiatives for addressing post-Marawi challenges, and how President Duterte would respond. Prof Wise also wondered whether President Trump would raise human rights concerns, including allegations of extra judicial killings, and how the Philippine side might react. 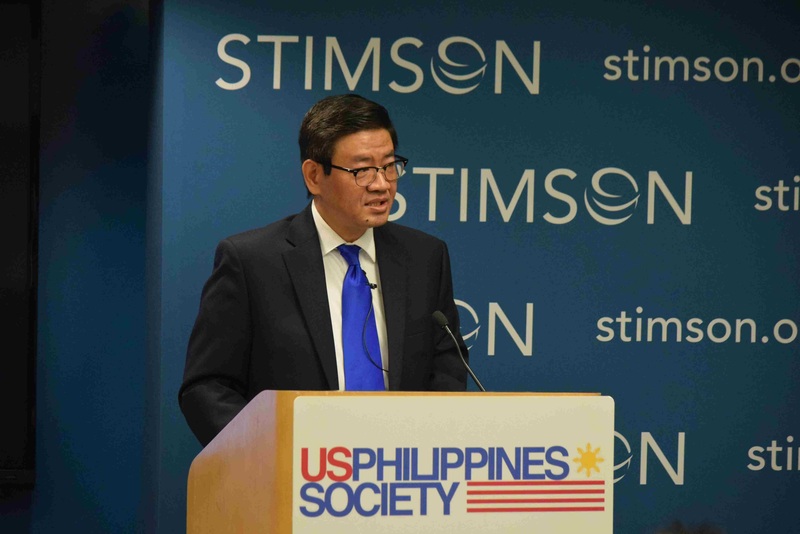 From the Philippines perspective, Prof Wise said it would be important to see how Duterte chooses to play his bilateral meeting with Trump – whether to emphasize the reality of a cooperative bilateral relationship, or to use the occasion to revert to the theme of an “independent” foreign policy that some have seen as code for distancing the Philippines from Washington. Other question marks center on the extent to which President Duterte publicly acknowledges USG assistance in the fight against militants in Marawi and how President Trump addresses the Philippines’ anti-drug campaign. Meredith Miller drew attention to the importance of economic and trade relations across the region as Asia-Pacific leaders prepare for the upcoming ASEAN, ASEAN-Plus, East Asia, and APEC summits. She noted that the summit meeting venues – Vietnam and the Philippines – stood as two examples of successful economies, with high growth rates, innovation, and potential to keep attracting foreign investors. She pointed to the importance of regional economic cooperation as a foundational aspect of ASEAN’s success. At the same time, Miller noted that Washington’s TPP withdrawal has contributed to an atmosphere of uncertainty as leaders prepare to address trade and investment issues. Some countries may explore opportunities to forge bilateral trade pacts with the U.S. But, the Trump Administration’s emphasis on reducing American trade deficits will directly impact any bilateral FTA negotiations with key Asian partners. Regional leaders will be keeping a watchful eye on the administration’s approach on trade policy elsewhere, including on NAFTA and the South Korean FTA. A major area of interest in the upcoming regional meetings will be the extent to which China and Japan might unveil investment and trade initiatives. After the 19th Party Congress, President Xi Jinping will go to the Hanoi and Manila summits feeling especially well-positioned to project a Chinese vision for the region. For Southeast Asia, including the Philippines as a U.S. alliance partner, a central issue going into and coming out of this month’s summits will revolve around regional perspectives on how best to maintain a balance in ties between Beijing and Washington.